The Development Agency of Dubrovnik hosted the Roadshow. The city is significantly dependent on tourism from the 12,000 plus cruise ship passengers that stream to the UNESCO protected old town. On the surface the town appears sustainable and locally sustainable, but closer investigation shows that the carbon footprint of the city is devastating once the cruise ships are factored into environmental carbon calculations. The project would first focus its investigations on the neighbourhood of Gruž. Gruž is sited immediately next to the only port where up to nine cruise ships can dock at one time during high season. Topographically Gruž is a major challenge as it rests on a severe slope that prevents public transport from accessing the many houses owned by a majority population of elderly. The City Vision would redesign the fenced industrial port to create a new relationship with port and the residents of Gruž. This reworked permeable green link would be biological in nature allowing both cruise passengers and locals to stroll unhindered and in shaded comfort up to Gruž or to the old town. 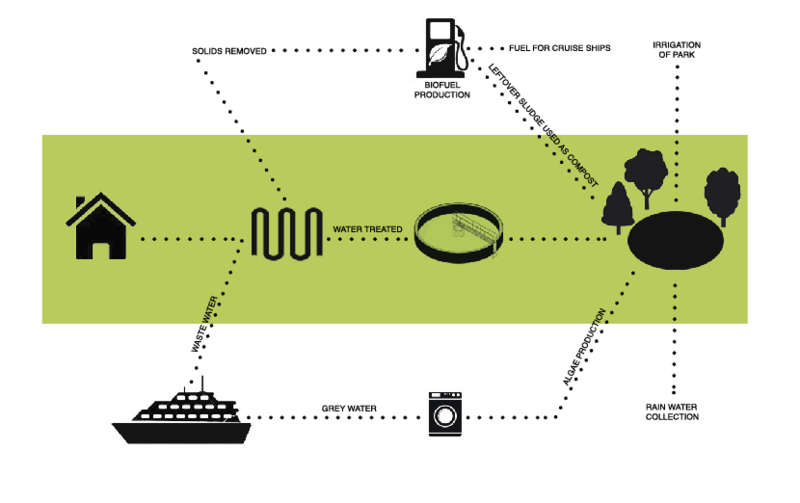 The major move of the ‘Vision’ would be the development of a circular economy that brings together the Bio-diesel needed for the cruise ships, bio-waste and sewage from the ships and the Gruž community. Floating algae generating arrays, bio-digesters and co-generation power plants would symbiotically combine to dramatically reduce the carbon footprint of both town and visiting fleet (floating cities). Others measures included a strategy of green facades, water taxis to reduce the flow of people to the old town, electric mopeds and a matrix of topographically accessible public buses fuelled by bio-diesel.